Mr Fourniret admits he is a "bad person devoid of human emotion"
A man accused of being among France's worst serial killers in decades has been forced to attend court amid angry admonishment from the prosecution. Michel Fourniret, the so-called "Ogre of the Ardennes", has refused to co-operate in his trial for the murder of seven girls and women over 16 years. Prosecutor Francis Nachbar said Mr Fourniret would no longer be allowed to manipulate anyone. Mr Fourniret's wife is charged with complicity in murder and kidnapping. An angry Mr Nachbar told Mr Fourniret at the court in the northern French town of Charleville-Mezieres: "Every day, Mr Fourniret, you will be at the trial or you will be brought by force. "You will no longer manipulate anyone... I represent society and society will not be subject to your caprices and your moods. Stop this intolerable indecency." The second day of the trial of Mr Fourniret, 65, and his wife, Monique Olivier, 59, began with the continued reading out of the alleged crimes between 1987 and 2003. Mr Fourniret has confessed to the killings, most of which took place in the Ardennes region of France and Belgium. The BBC's Alasdair Sandford in Paris says Mr Fourniret has refused to speak unless proceedings take place behind closed doors. In a letter to the judge Mr Fourniret admitted he was a "bad person devoid of human emotion". The court has heard how his wife helped in his quest to seek out virgins. The women, aged between 12 and 22, were then allegedly raped and either strangled or shot. The parents of the victims have been in court to hear the listing of the crimes. Mr Fourniret has played down his wife's role, saying he beat her and that she had fallen "into the odious nets of a manipulator" who led her into "a perverse game". The proceedings have been suspended for a few hours because of a protest by lawyers over French legal reforms. 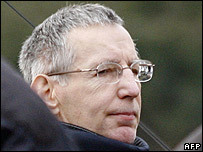 Mr Fourniret was arrested in Belgium in 2003 after an attempt to kidnap a 13-year-old girl. Now aged 17, she will be giving evidence at the trial, but out of public view. Investigators say the method used by the couple was nearly always the same. He would spot a potential victim while driving and stop to ask for directions, then persuade the person to get into his car. 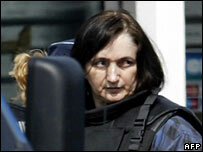 Ms Olivier's presence in the vehicle was designed to help reassure the future victim, according to the prosecution.